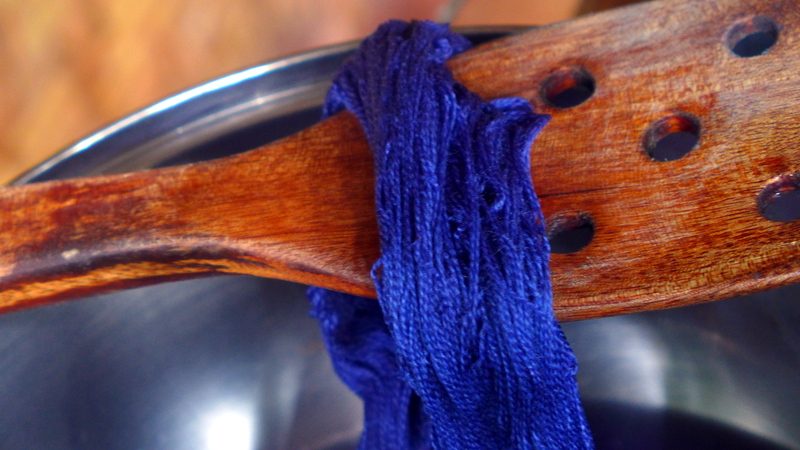 Over the past week I have been busy learning about hand-dyeing. Below is a chronology of my experiments. Enjoy! 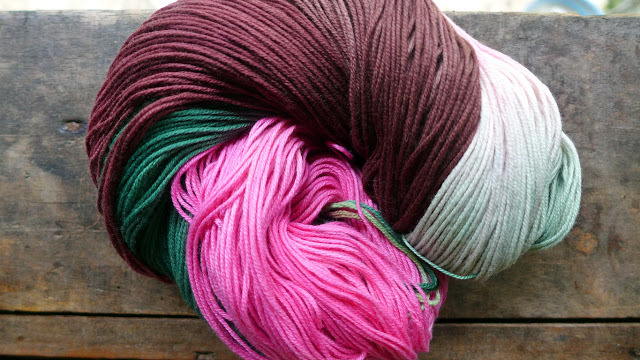 Am trying dyeing, this is pure silk which dyes beautifully. The challenge is to make brilliant even colour and then to fix the colour. This is Venus dye, a coal tar based dye. Cream of tartar creates deep hues. Salt fixes the dye. Alum does as well, hopefully, fastness will be good. Venus recommends using salt during the last 20 minutes of simmering. However, accdg to some readings, salt doesn't actually fix the dye, it only helps in absorption. I use alum instead, which I hope will work! The next challenge is to use natural dyes ... 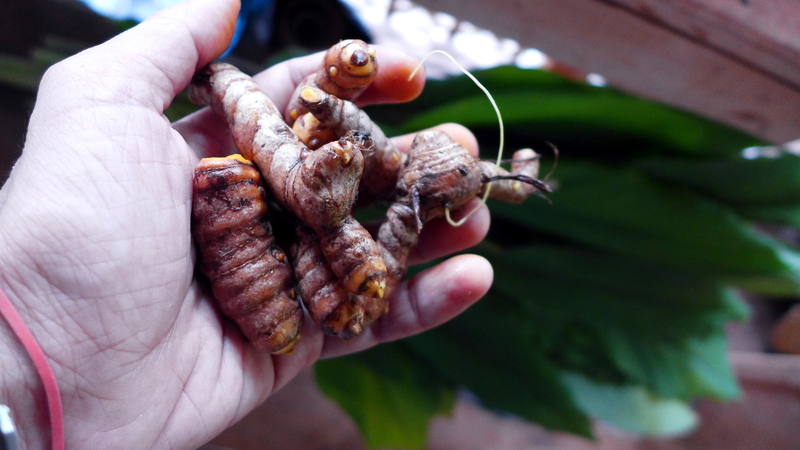 I wasn't able to get yellow Venus dyes today so tomorrow I will try turmeric, plenty in the garden! These are the other colours. 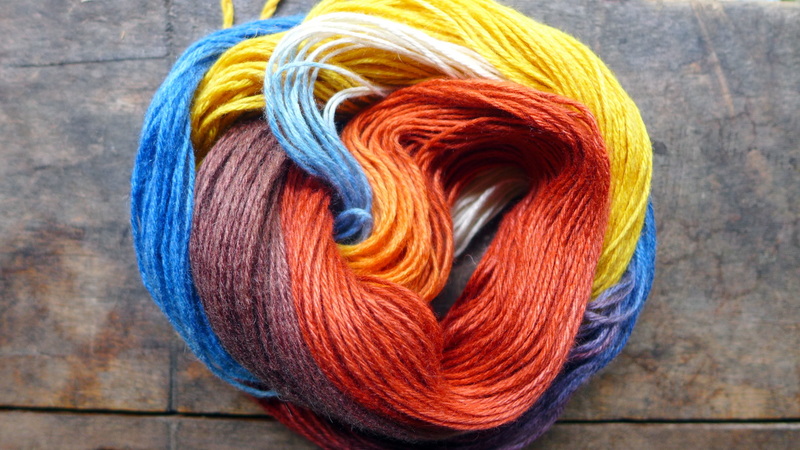 I used the Venus dyes plainly, no colour mixes, two sachets per 50 grams of silk. At times, two sachets didn't seem enough, particularly the colour purple and teal. 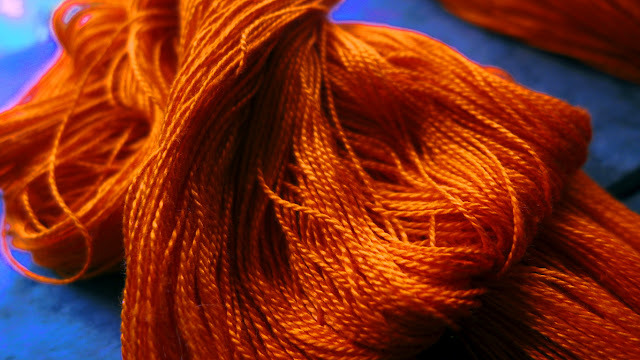 Additional notes: cream of tartar deepened colours; vinegar lightened colours; stirring frequently while simmering helps absorption; salt helps absorption; simmer at least an hour in which case dye is exhausted completely water is nearly clear; immerse damp yarn in dyebath, better than dry yarn; scouring yarn might help absorption; wet yarn always have more brilliant deep colour than dry. Venus says iron dyed fabric while damp, perhaps that help set the dye. Can't really iron the yarns. 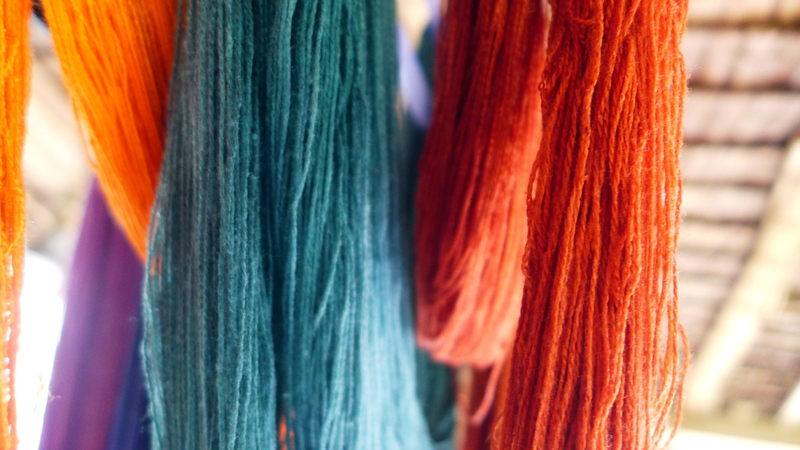 But do not dry dyed yarn under direct sunlight. 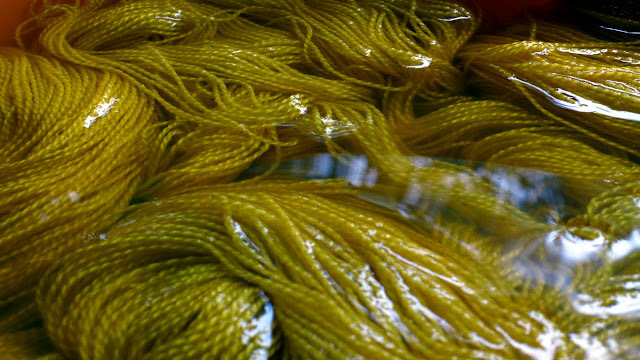 Dyeing silk yarn with turmeric. 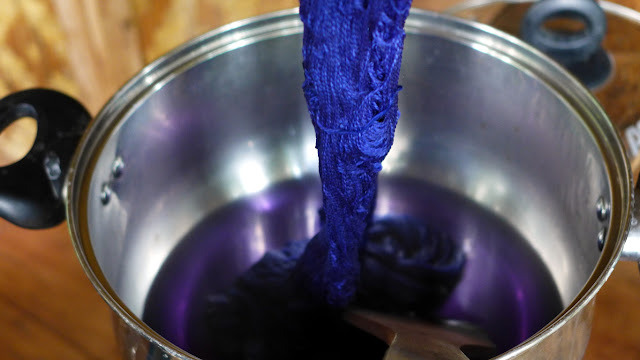 Soaking in dye bath for longer time creates more vibrant colour. My first hand-dyed multicolour! 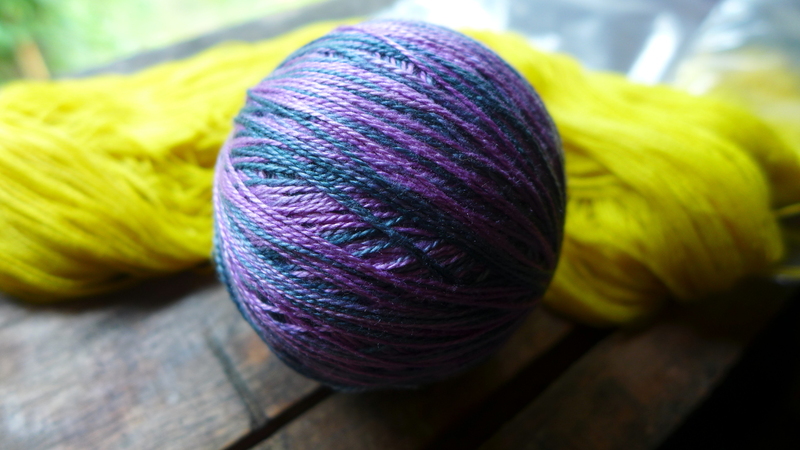 On the swift, my first solid colour, both using acid dyes. In the background, my first natural dye using turmeric. I used alum as mordant for the first two. 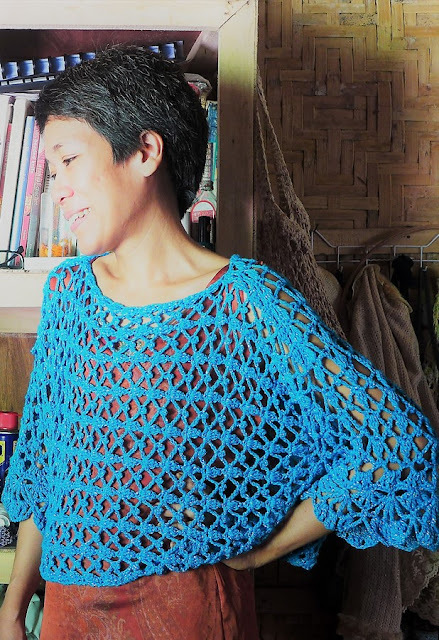 Silk yarn lace. 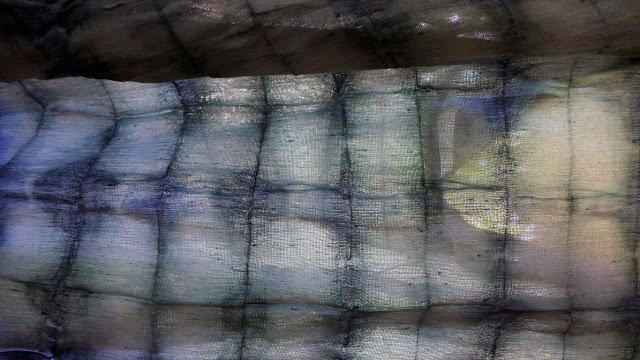 The silk after drying, we can see where there are failures. 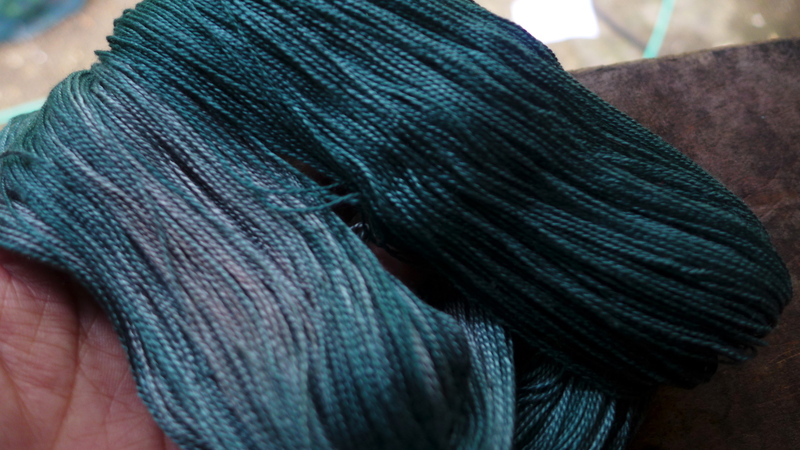 The teal and dark red have lighter areas which means we need to agitate/mix the yarn in the dye bath frequently to allow all dyes to be absorbed in all areas of the yarn. Salt or vinegar added later allow full exhaustion of the dye. The orange exhausted much better so the colour is deep and even. The yellow (turmeric) is also deep and even after soaking the yarn in cold dye bath for 2 days. 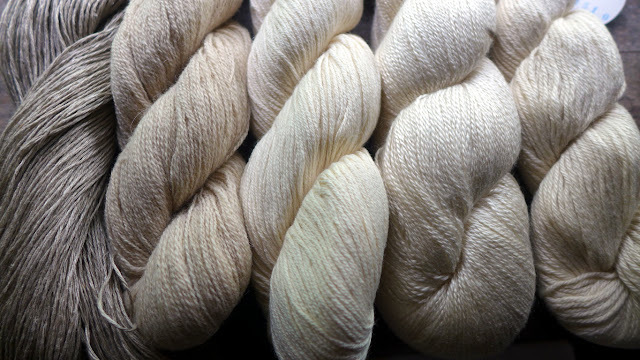 Last photo show undyed yarns: (from left to right) linen, natural white yak, cotton-cashmere, silk-cashmere and silk-yak. 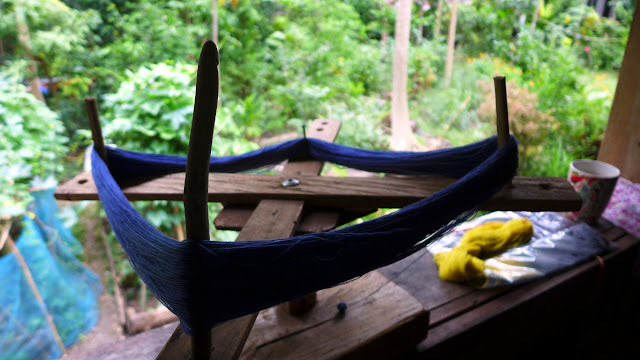 The most challenging will be the yarn that is composed of a mix of animal and plant fibre. Which dye to use: acid dyes (for wool, silk, protein fibres, and nylon as well as a number of synthetic fibres); fibre reactive dyes (for cotton, linen, plant fibres); and disperse dyes for polyester. Seems that In practise, making multi-colour or self-striping yarn is easier than achieving a flat, deep, even single colour! 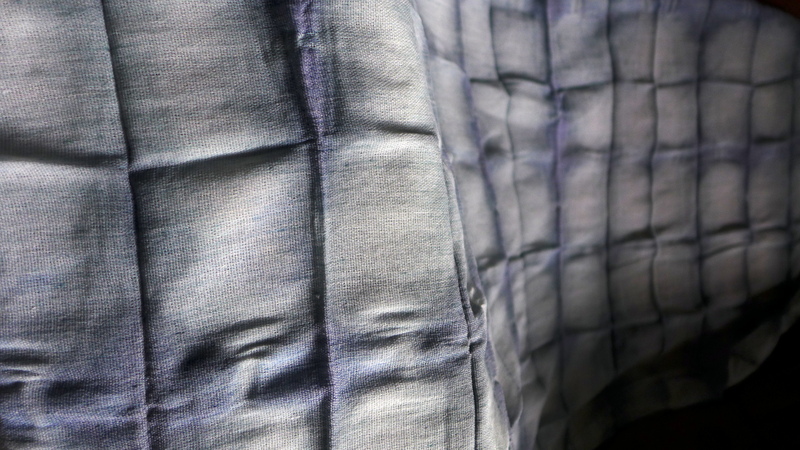 Continuing my experiments in hand-dyeing. This is silk-cashmere. 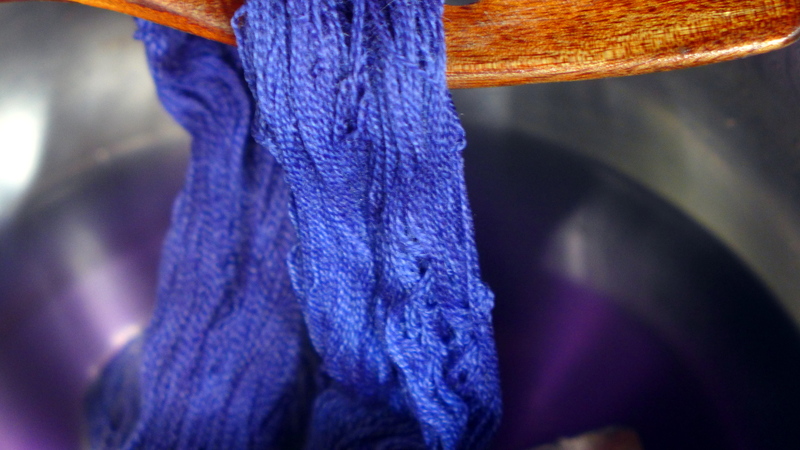 Important when dyeing wool: do not boil, do not agitate, do not rub or the wool will felt. Always use dyes with care: "Aniline itself is a very toxic substance. The dyes we use today are much less toxic than aniline. 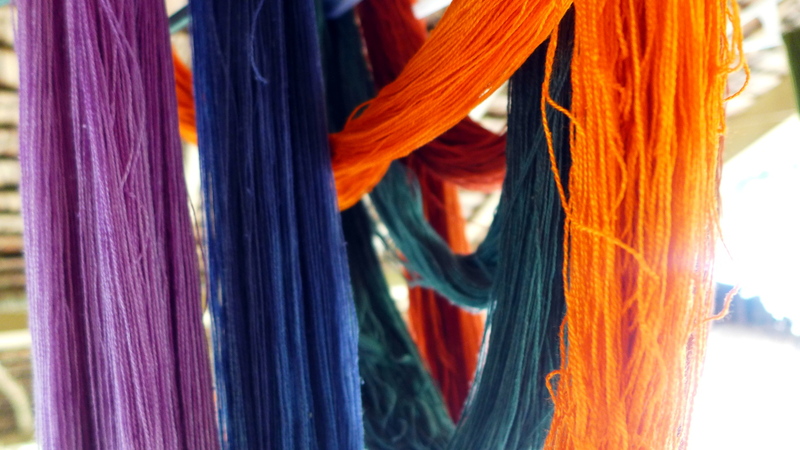 The greatest risk of disease or injury due to modern acid dyes is by ingestion of or exposure to dye dust. These scenarios are normally confined to textile workers. Whereas the dye itself is normally non toxic, the molecules are metabolized (usually in the liver) where they may be broken back down to the original intermediates used in manufacture. Many intermediate chemicals used in dye manufacture have been identified as toxic and their use restricted. " 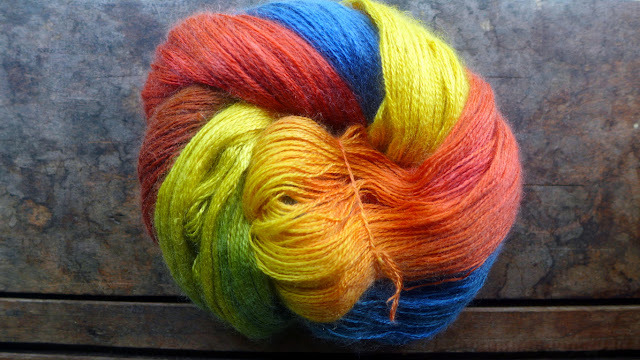 I used primary colours (Venus alinine dye, an acid dye) red, blue, yellow. I tried two techniques (1) scouring with a humectant and vinegar, then hand-painting the yarn, wrapping in plastic and steaming; and (2) scouring with humectant and vinegar, then dipping the yarn in three different dyes, adding salt if dye is not exhausted, adding cream of tartar if still not fully exhausted. The method (2) is best. 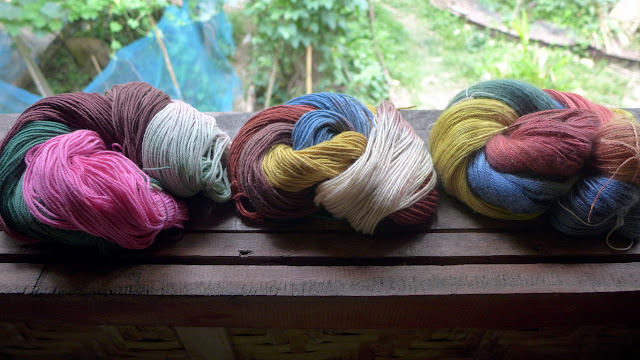 Acid dyes supposedly do not need mordants. The water runs clear and there is no staining. 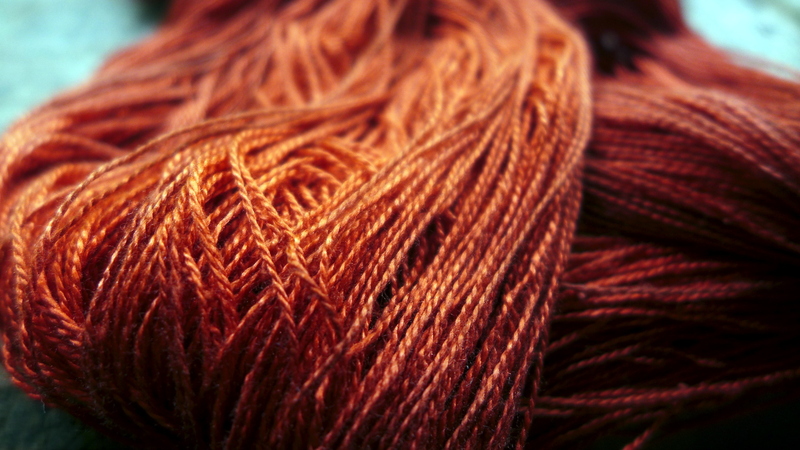 This is silk-yak, with the addition of brown and tying to leave a portion of the yarn undyed. Next task is to use cold water dyes. And here is the last of my multicolour dyeing experiment - this is cotton-cashmere. The acid dye permeated the cotton and I am hoping it will be as colourfast as dyed wool. When the yarns are crocheted and then washed, we shall find out. Local acid dye colours are of OK quality, not very impressive, not as vibrant as I would want. I need to use imported dyes to test, as well as test a wide range of natural materials as dyes. 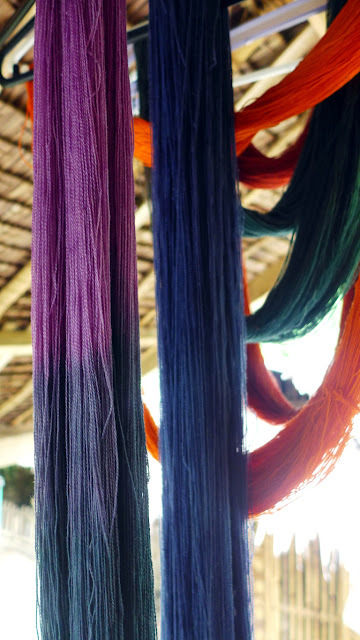 The advantage of natural dyes is that they can be used on both protein and plant fibres, as well as some synthetics and the mordant is safe - alum. 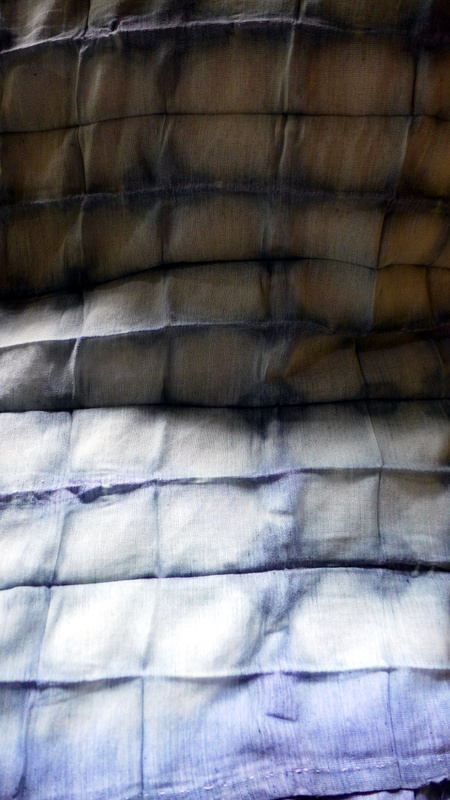 With some dye left over, my first try at shibori on cheap fabric, this is muslin.